Amelie Cardon 12MPH, left, checks the protective gear of people going into an Ebola treatment area in Moyamba, Sierra Leone. 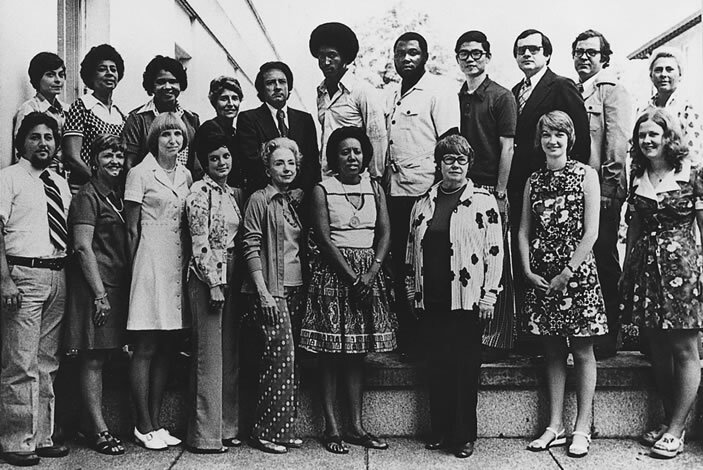 The first Masters of Community Health (MCH) class in 1975. 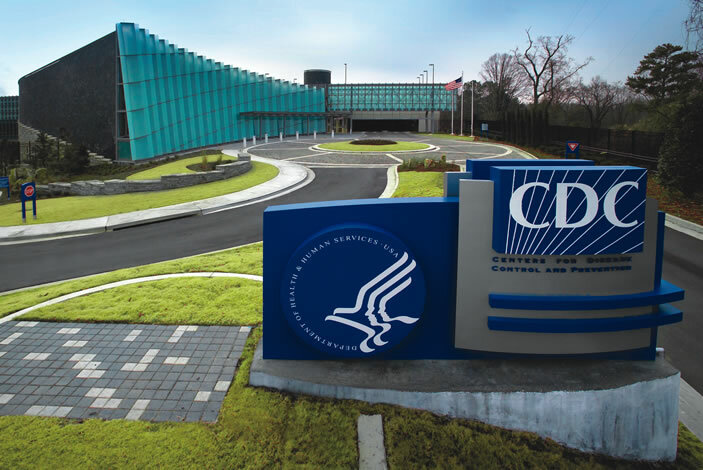 Rollins and the CDC work in close collaboration. Grace Crum Rollins Building (left) and Claudia Nance Rollins Building (right). Support from the Rollins family has been crucial to the school’s success. Rollins alumni are in leadership positions in public health powerhouses like the CDC, USAID, PEPFAR, WHO, and the Bill & Melinda Gates Foundation. They're also in the field, perhaps developing AIDS programs in Africa, establishing a microcredit program for women in rural Egypt, or leading studies to prevent birth defects. 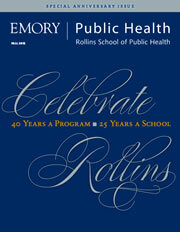 The Fall 2015 issue of Public Health magazine is a special anniversay issue, celebrating 40 years of the public health program at Emory and 25 years of the Rollins School of Public Health. Amelie Cardon 12MPH spent three weeks last spring in Sierra Leone and Guinea assessing Ebola surveillance. 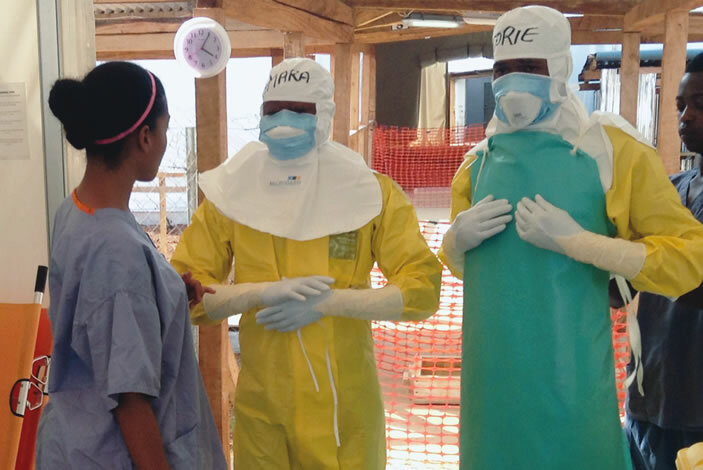 During daily meetings at the District Ebola Response Center in Kambia, she crossed paths with no less than five other Rollins School of Public Health. alumni—three with the Centers for Disease Control and Prevention (CDC), one with the World Health Organization (WHO), and one with the International Rescue Committee. "It's amazing that wherever I go to deal with public health issues, I run into fellow Rollins alumni," says Cardon, who works for Action Against Hunger France. "It's a testament to the excellence of the Rollins experience. The school empowers its students with the highest level of skills, which they use to promote health around the globe." Promoting and protecting health around the globe is the essence of Rollins' mission. This anniversary offers an opportunity to reflect on the significant impact the Rollins School of Public Health has made on the lives of people throughout the world. Rollins has made an impact through education, training new generations of professionals who are eager to continue and further the work of public health. Rollins has made an impact through discovery, advancing understanding in critical areas of public health, from HIV/AIDS to diabetes and obesity, and from safe water to emergency preparedness. And Rollins has made an impact through community engagement, building relationships to improve the health and well-being of the communities in which it works. 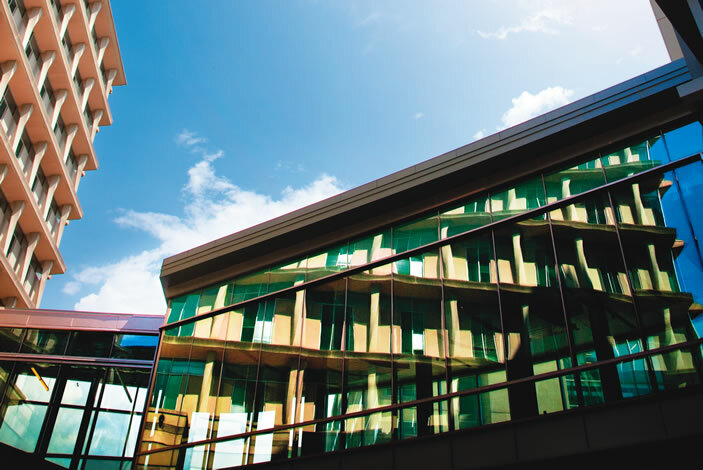 "The School of Public Health has practiced consilience, or the 'jumping together of knowledge,' first by joining the skills and knowledge of Emory and the CDC, but then by attracting the passions of an entire university to join in improving the well-being of people everywhere," says William Foege, professor emeritus of global health and a fellow at the Bill & Melinda Gates Foundation. "It is a remarkable development in a short period of time." What is now the Rollins School of Public Health began as a fledgling program of community health within the Emory School of Medicine. 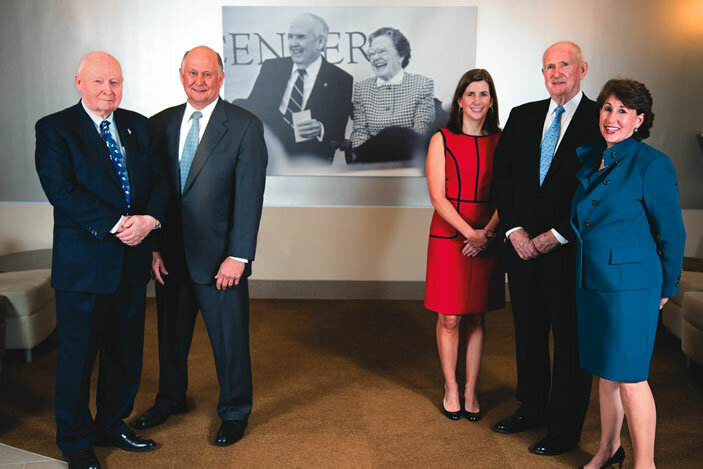 Its creation stemmed largely from the vision of Tom Sellers and Bill Marine, preventive medicine faculty in the Department of Community Health, with the strong support of CDC chief David Sencer and Emory president James T. Laney. The CDC alliance was, and is, a defining feature of the school. CDC professionals advocated for the program, taught and still teach as adjuncts, and foster close collaboration. "My father was the longest serving director of the CDC, but I think deep down, helping start the masters of community health program at Emory was one of the things he was most proud of," says Stephen Sencer, senior vice president in Emory's Office of General Counsel, of his father, David Sencer. In those early days, the handful of faculty and staff was housed in a small white, blue-shuttered house on Clifton Road. The program's first class, accepted in 1975, was comprised of mid-career professionals who cobbled together individualized curricula from three core community health courses and classes in other parts of Emory University and even other institutions. In 15 years, the program grew into a school, thanks to the efforts of a cadre of believers, including Foege, Constance Conrad, the program's first director, Eugene Gangarosa, its second director, Charles R. Hatcher, Jr., director of the Woodruff Health Sciences Center, and Jeff Koplan, then director of the CDC's National Center for Chronic Disease Prevention and Health Promotion. When it officially became a school in 1990, it was the first new school at Emory in 72 years. The new school, led by its first dean, Raymond S. Greenberg, was housed on an increasingly crowded floor of the American Cancer Society building. It got a tremendous boost when its vision was embraced by O. Wayne Rollins, a highly successful local businessman and philanthropist who had been a generous and longtime supporter of Emory University. So generous that in 1994 Emory named the young school the Rollins School of Public Health to honor the family's philanthropy. Over the years, the Rollins' contributions have been transformative. The family provided major gifts to construct two distinctive buildings, giving the school the space and the facilities to flourish. They have given unrestricted endowment funds that have allowed the school to recruit and retain some of the nation's best faculty. And they funded the Center for Public Health Preparedness and Research to address natural and man-made threats to health following 9/11. "It would be impossible to overstate the impact the Rollins family has had on our school," says Kathryn H. Graves, associate dean for development and external relations. "Their belief in and contribution to our school have been critical to our growth and our success. We simply wouldn't be where we are today without them." In 1995, James W. Curran was named the school's second dean. 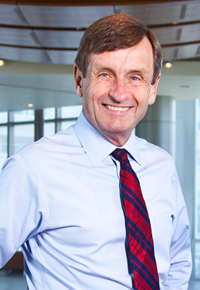 Curran came to the post from the CDC, where he had led the nation's efforts in the battle against HIV/AIDS. He inherited a small school, but one ripe for growth. "When I came to the school, although it was new, it was already grounded in excellence in teaching and research," says Curran. "It was also part of an excellent university in a city renowned for public health. I could see nothing but potential." Despite his optimism, even Curran might not have envisioned how far the school would come in his 20 years at the helm. Today Rollins ranks seventh among U.S. schools of public health, according to U.S. News and World Report, and is ranked among the top 10 schools of public health in NIH-funded research. It is recognized globally as a center of excellence in public health education and research. Says Lawrence Klamon, former chair of the Dean's Council and a major supporter of the school, "To start so small and grow so quickly into one of the leading public health schools in the country is a testament to the excellence of the faculty and staff, which in turn produce excellent graduates who go out and change the world." Quite a lot of graduates. By 1990 when it achieved school status, the public health program had produced 300 graduates in 15 years. Today, more than 8,000 Rollins alumni are working around the globe. You'll find Rollins alumni in leadership positions in public health powerhouses such as the CDC, USAID, PEPFAR, WHO, and the Bill & Melinda Gates Foundation. You'll find them in the field, perhaps developing AIDS programs in Africa, establishing a microcredit program for women in rural Egypt, or leading studies to prevent birth defects. Says Stanley Foster 82MPH, global health professor emeritus, "If you are trying to look at the impact that Rollins has made, I would urge you to look at its graduates." Rollins embarks on its next chapter in a public health environment that has become a victim of its own success. Following the eradication of so many diseases, the government has cut funding for public health organizations significantly. Vaccination rates have fallen, as evidenced by the recent measles outbreak in California. Antibiotic-resistant strains of bacteria are emerging at a rate that has scientists and physicians worried. And as the Ebola epidemic showed all too well, health at home can't be protected without protecting health across the globe. Says Dean Curran, "The public health problems of the future will require even greater commitment, and the Rollins School of Public Health will be there to meet them."